Official speaker of the national assembly of transition. of Benghazi after [its staff] joined the people's uprising. Baida are showing a fortified atomic bunker in the souterrain. company that is using parts provided by a U.S. company in Michigan. Who Makes The Machinery ? Visitor to "blueprint news" who found this site on May 23, 2012.
by mass rallies, bloodshed and the fear of national leaders. language special published by Al-Jazeera on February 25. UPDATES for the following days have been embedded ! Protesters controlling major part of Libya. Fierce fighting and dozens wounded in Tripolis. from above a fortified town gate. in the Libyan town of Misurata ["Masrata"]. please use the embedded link to Al-Arabiya TV. the abolishment of the regime. 11 deputies [of parliament] resign from the ruling party. 59 deputies [of parliament] decide to return [their seats]. Demonstration of protest in the capital of Amman. Calls for political and economic reforms. People died, five were wounded in Mosul. Demonstrations in Baghdad, Kirkuk and other towns. The government of transition needs to be saved from failure. Al-Ranushi declares his resignation from the Tunisian government [amidst] controversial tendencies [for the] political leader to follow. Protesters stick to their demands [made during] the uprising. Visitor statistics for the current blogspot, registered 24 hours after its creation. As visitors will be registered only, if their web address is containing a country denominator which is rather rarely the case, the real number of visitors within 24 hours has to be estimated based on further statistical material of my main site. 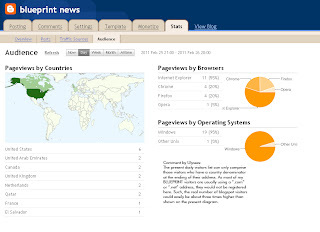 Therefore, a number of 50+ visitors within 24 hours can be regarded as a realistic estimation. the army are joining the protesters and are opening the army depots. * al-Zaouia = Small town west of Tripolis. complete dossiers to accuse the Gadafi regime. Switzerland will freeze the eventual assets of Gadafi and his family. At least 16 died in enduring confrontations in al-Zaouia west of Tripolis. Ahmed Gadaf al-Dam, personal representative of Gadafi, has resigned. the airstrip of Misurata (*) to get the rebels there under control. * Misurata = Town of the coastal region, east of Homs and Tripolis. announce their participation in the revolt of the people." - Benghazi folks celebrating their victory while shooting is going on. 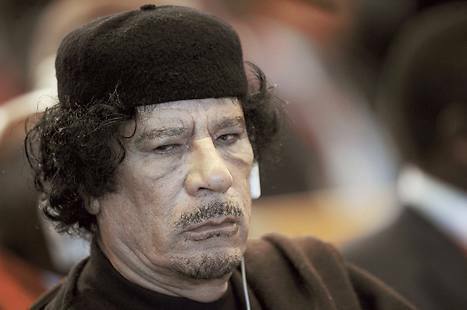 - There are rumours that Ghaddafi might intend to blow up Libyan oil wells. directly involved in the Lockerbie incident. 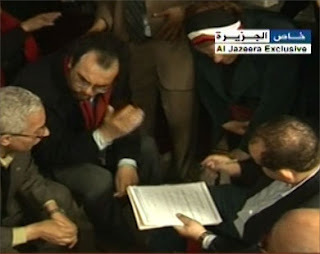 Defiant Gaddafi speech shows he would rather die "a martyr"
which he is decided to defend by any means that is needed. who are considered to be very influential among the people. world resigned from their posts. Arab League holds emergency meeting in Kairo. had first priority in the current state of urgency. said they refused to bomb protesting citizens at Benghazi. deployed by the government to bomb or shoot protesting citizens. Some people are said to have been burnt alive by mercenaries. not in control of the region any longer. According to Italy, marine oil terminals in Libya hold operations. Comment by Ulysses: Such must have behaved the German "Fuehrer"
Adolf Hitler in his bunker during his very last days in 1945. Britain's Tony Blair and Libya's Ghadafi shaking hands. behalf of the U.S., since then turned into an "honourable"
- Another day of unrest in Yemen, Bahrain and Libya. - The Libyan oil connection (see above). on their way to Syria for a purported arms delivery. Today, it seems that rebellion in Bahrain, Libya and Yemen reached a point of no return, a final breach of the dyke, that will sooner or later lead to replacement of the actual leadership. Whatever time it might take to achieve the peoples' goal of freedom, democracy and an end to corruption, now, the predicted development received its final impulse in all of those countries: Huge numbers of dead and wounded civilians from the streets of Manama can't be forgotten quickly enough to enable Bahrain's ruling family a return to "business as usual". As to Libya and Yemen, the rebellion has already lasted too long and required too many victims that a kind of status quo could be reached again. One hour ago, I recorded a news special on the Arabic channel of Al-Jazeera which has everything in it to describe how the Arabic world is driving into a chaos that, we hope, might finally generate a new era of freedom and democracy. When traditional structures of power finally broke away in Tunisia and Egypt, opposition groups of other Arabic nations took the initiative to give vent to their anger. The Algerian opposition had already taken to the streets when the Tunisian revolution just began and nobody even imagined that Egypt's citizens, by starting their own revolution from scratch, would bring about enough manpower on the streets of Kairo, Alexandria and Suez as to overtake the Algerians in their fight for freedom and democracy. ruling Khalifa family. Protesters in Manama. A similar situation emerged in Yemen where protests against the Yemenite president are already lasting six days. Lots of protesting students and other demonstrators meet with pro-government protesters. the streets of Aden in Southern Yemen. Protesters on the streets of Yemen's capital Sanaa. From here, the uprising spread to all over Yemen. 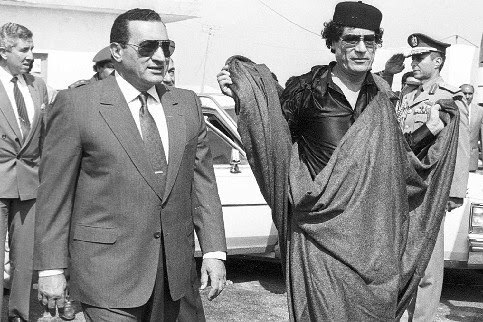 Even Libya under the rule of its notorious president Ghadafi and Sudan, ruled by its despotic president Basher, are on the list of ideal candidates for the next revolutions to come. of life led by Ghadafi's family clan. The below picture is showing organized pro-government protesters. enough and reliable pictures out of Libya. against the (political) system in Libya." Not to speak of Iraq and Jordan, both countries being closely linked together because of a common history under the rule of the Hashemite dynasty. By the way, the border between Egypt and the Gaza strip is still closed. That might change within the days to come, such enabling Palestinian habitants of Gaza to get in some aid. Iraqi citizens taking to the street. shooting of protesters (was announced as well). Yemen: Students taking to the streets on February 12, 2011.
the Republic of Egypt together amidst of turmoil.